The process by which threads of any substance are interlaced to form a continuous web is weaving; the simplest form consists of one set of long fibers placed side by side —the warp—across which another set of fibers—the woof, or filling—are interlaced at right angles, the woof threads being passed under and over the warp threads alternately. 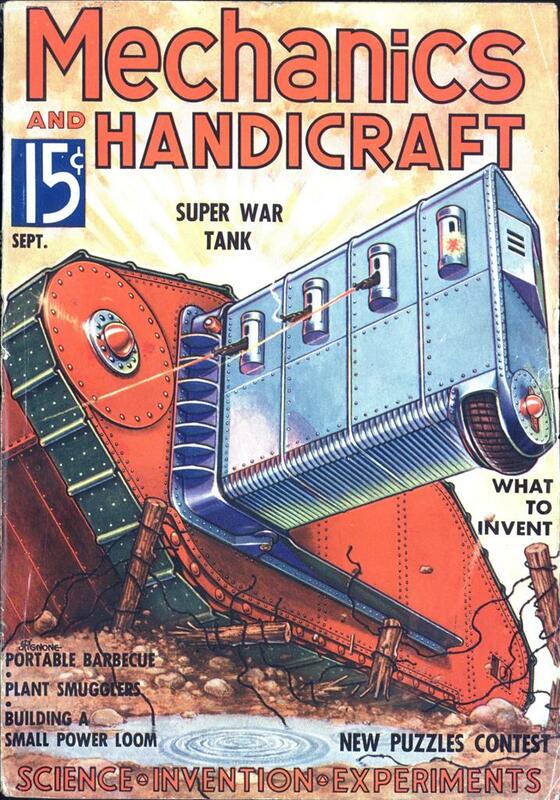 In this article we are concerned with the construction of the latest type of a small, simple motor-driven loom for the home. In almost every country of the world old-fashioned hand-loom weaving is carried on in many homes, either for pleasure or profit. Nevertheless, there is no question of the superiority, in every respect, of a power loom to the handworked type. The workmanship and finish of the product is far in advance of that of the hand looms. As regards speed and efficiency, there is, of course, no comparison. The power loom, described here, may seem intricate and complicated but, upon careful inspection, it will be seen to be very simple. It is especially designed for weaving 24″ material or narrower. If ma- terials of greater widths are desired, the loom can be built proportionately larger, according to the width desired. On this loom we can use cotton, rayon, silk and worsted, which gives us the choice of a large variety of materials. The description given is for a plain or taffeta weave but, by the use of additional eccentric levers, the kinds of weaves are almost unlimited, and one can make satins, gros-grains, twills, serges, etc. The first step in the process of construction is to build the loom frame of straight – grained dressed wooden beams, preferably 2″ by 4″ pine. First we erect two side stands, and connect these with other beams to form a box frame (thus the term “box loom” originated). The height of the side stands should be about 30″, the width 45″ and the cross pieces 34″ long— convenient dimensions for home use. The simplest method of joining these pieces is to connect them with metal plates and carriage bolts. Next we must fasten the bearings for the main shaft to the side frame; then line up the main shaft (1)—which should be of 1″ cold rolled steel— so that it will rotate easily. On one end of the shaft (1—Fig. B) we fasten a gear (34) about 14″ in diameter, with a threaded stud in a slot in a spoke located about 3″ from center (2 in Fig. A), which is called batten swing. The slot is for adjustment, so that the swing of the batten arm can be timed accurately. The wooden batten arm (3) is 1″ x 3″ x 14″, connecting to batten (4). The batten (4) is a beam 68″ long on which a reed about 26″ in length is attached and centered (Figs. B and K). The batten rests on the batten leg (5), swinging on a pivot (a convenient stud on the bottom beam of the frame). On the same stud the picker stick, which swings back and forth with the batten, is fastened (Fig. B). The gear (7) is put on the shaft first, of course, inside the loom frame; this connects with and drives gear (8), in turn clamped to shaft (9). The speed transmission of these gears is 1 to 4, which means that for four revolutions of shaft (1) there will be one revolution of shaft (9). This allows us to make any weave where the repeat is not over four picks. Wooden or iron eccentrics (10), shaped as indicated in Figs. A, B and E, are joined to shaft (9). At every revolution one or the other eccentric presses down the desired lever (12). These levers are constructed of wood and go on a pivot placed in bracket (11), which should be attached to the cross piece of the frame in back of the shaft. Each lever has a roller located directly beneath shaft (9)—the rollers may be omitted if desired and the levers may be faced with metal. A wire (13) is hooked to the end of the levers (12), which in turn connect to the wooden levers (14) situated at the top of the machine. Levers (14) are attached to the harness shafts (18) by cords (17) winding over rollers (16), by the method illustrated in Fig. J. By each revolution of the machine, the eccentrics (10) press or release levers (12), which lifts or drops the shafts (18). The take-off beam (19), Figs. B and D, is about 6″ in diameter and should be covered with sandpaper. A shaft (22) for the entire beam, or a correctly centered stud on each side of it, is affixed through the frame extending far enough to give room for gear (23) to be fastened to the outside. The press roller (20) should be about 3″ in diameter, covered with felt. It should be hung in U-shaped iron guides on each side of the frame so that it can press the material down upon the beam. Roller (21) should also be a beam of about 3″ in diameter, which is to take up the finished product. The simplest way possible of arranging the take-up is to connect (21) with (19) by a cross belt. A duplex transmission gear (24) is then used to connect gear (23) with the pick wheel (25). The feed rod, connected to the batten supporting arms, has a dog which fits into the teeth of wheel (25); this operates the take-up beams, which move the finished woven material forward the desired distance, depending on the pick calculated to be put in the finished material. Figs. B and D indicate the shuttle-drive arrangement. On shaft 1, somewhere near the center, a small bevel gear (26)	is set to drive another bevel gear (27),	which should be twice the size of (26). An iron or steel shaft (28) is then placed in bearings (29), situated at right angles to shaft (1), and a crank (30) is attached. About 4″ away from the center of (30) is placed a stud (31), which has a turnbuckle (32) pivoted in the center. In each end of this turnbuckle is fastened a screw-eye, to which is attached a strap, tied at the other end to the picker stick (6). These straps can be made of very heavy leather, cord or belting; the length can be determined when the crank is brought to a position where the stud (31) is vertically below the shaft (28). In this position, both straps should be stretched. Drive gear (35), Fig. A, is fixed to pulley (36); the belt (37) is hooked up with a 1/3-H.P. motor (38). The threads running the length of the material—the warp—are made up of a thickness to be decided upon. If we are going to weave a coarse or heavy material, we will use thick or heavy thread and a fewer number of threads per inch; but for a fine cloth, we require yarn or thread that is very thin. The threads are wound around a beam (39), Fig. A, about 5″ in diameter and a little less in length than the length of the loom. A shaft (43) runs through the center of beam (39) and extends at each end so that it can be slipped into bracket (44) behind the loom frame. Weights (42) are suspended from a rope, nearly encircling the beam and causing tension on the warp when the loom is in operation. The free end of the rope is fastened to a hook, attached to the frame. After the warp is hung in the loom, it is passed over cylinder (41) and then each thread is alternately passed over and under two warp sticks (45), tied at the ends by cords in turn fastened to hooks in the frame. This prevents the sticks from moving too far forward when the threads of the warp move as the goods are woven. From these sticks, each thread of the warp is entered into the harness. The purpose of the warp sticks is to have the warp divided alternately, one thread up and one thread down; so that, when a thread breaks and the repair is made by tying on an additional piece of similar thread, it can be passed under or over the picker stick. In this manner, what is termed “a straight warp” is always maintained. The harness (18) comprises a steel frame, which supports the leases—each of wire, flat steel, or heavy cable-woven thread, in the center of which is a metal eye or heddle, similar to but larger than the eye of a needle. Through this eye a thread of the warp is passed; we need as many leases as there are threads in the warp, each thread of the warp passing through its individual heddle controlling the raising or lowering of the warp threads in process of weaving. The leases are hung or mounted on the harness frames, and the number of frames is determined by the type of weave. The one described is composed of four harness frames. From the harness, the warp threads are passed through the reed (47), Figs. B and C; this is a comb-like arrangement of flat steel. The spaces between the flat pieces of steel wire in the reed are called dents. Through this space are passed a given number of threads, usually two, three or four, depending upon the coarseness or fineness of the yarn in the warp, and also on the quality of the material to be woven. After the warp threads are passed through the reed, they are then laid over the bar (46) on the back of the breast beam and fastened around the take-up roller. We are now ready to consider the shuttle: this is the housing for the supply of yarn that will compose the woof threads that run across the material to interlock and hold in place the warp threads. This makes up about fifty per cent of the material. This shuttle is thrown along the batten by the picker sticks (6). The mechanism of the loom is so set and timed that the shuttle travels when the threads of the warp form a shed or opening for the shuttle to pass through, and when it does so, the filling thread is put in position, and then packed into place by the reed (47), which pushes the filling forward. This entire operation, which is one revolution of the loom, is designated as a “pick.” The next pick, or the return of the shuttle to the other side, carrying the thread across, is when the loom again revolves one turn. Thus, the shuttle alternates from one side to the other. The supply of yarn or filling placed in the shuttle is wound on a tube or quill, and its tension regulated by a series of fine strings in the shuttle. As the material is woven, the take-up roller is operated by the gears (21 to 25) designated as the take-up motion, and moves the finished woven material forward. Such parts as shuttles, quills, harness, heddles, etc., should be purchased at any loom supply house. Aside from the parts specifically detailed, considerable latitude in dimensions and materials is permitted, hence no specific dimensions for the parts are given in this article. The editors would like to hear from those readers who build and operate this loom. BTW, aren’t “plain” and “taffeta” the same thing? Over, under, over under? 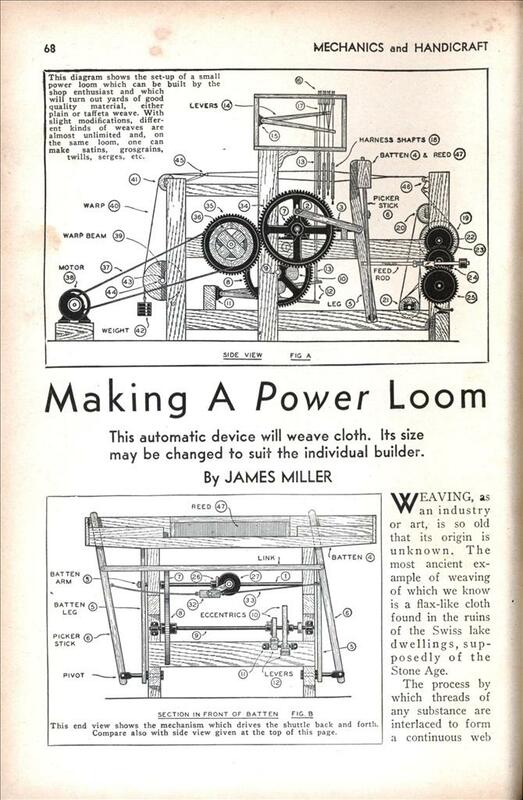 I am wanting to use this design to build a domestic power loom, but seem to have a problem loading the second page of the article. The copy i have managed to download is very blurry, and I am not able to study the mechanisms on that page. Is there anyone out there with a good copy of this page. It would help me immensely. I ca not get second page to load at all, or any other page for that matter.